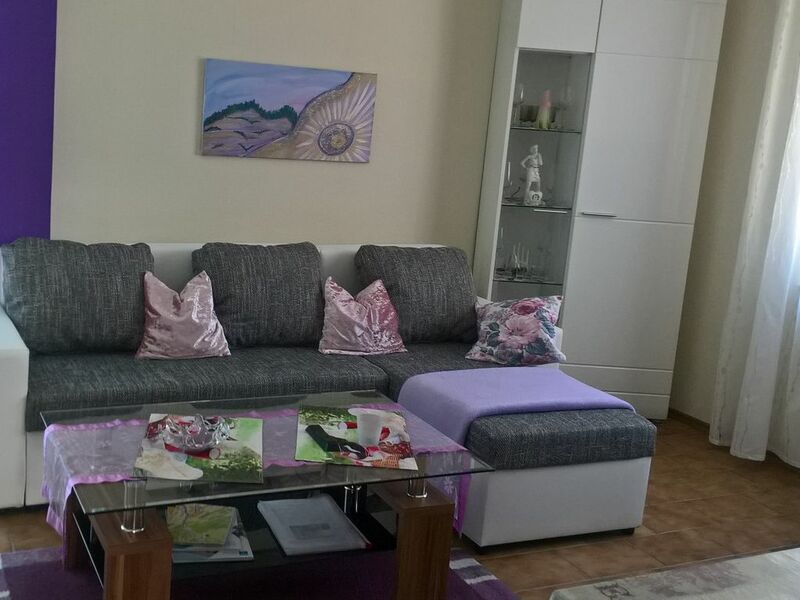 Apartment in the heart of Bad Kissingen spa facilities and the center within walking distance. A romantic Seingarten surrounds the terrace and invites you to relax. Romantic Non smoking - Apartment (smoking on the terrace). Parking and wireless Internet for free. Our 40 square meter apartment is centrally located to the city center and has only 1 level to accessibility. Localities and shops for daily needs are in the immediate vicinity. The living area with a glass cabinet, sofa bed, table and armchair, is bright and friendly. Right next to the kitchen is an additional dining area. The sleeping area with wardrobe and double bed is separated from the living area by a fixed partition. The kitchen is fully equipped with a 4 burner stove, refrigerator, coffee maker, kettle, egg cooker, toaster, microwave, etc. Bathroom with window, toilet, sink and mirror, bath with shower curtain. The apartment is located on the lower floor with only 1 step and is wheelchair accessible. Arrival is also possible by train or bus. You can relax in front of the living room, on the large terrace with lovingly landscaped rock garden. Garden furniture is of course available. With the city bus you can reach the KissSalis thermal bath comfortably and free of charge. The bus station "Berliner Platz" is only a three-minute walk from the apartment. Parking in front of the house and wireless internet free of charge. Bathroom with window, towels, hair dryer, toilet paper and cleaning products available. The apartment is located on the first floor. You have only 1 level to deal with, then everything is barrier-free. Also suitable for wheelchairs. Bus station and shops in the immediate vicinity. Parking in front of the house and wireless internet free of charge. Schöne gemüdliche Wohnung mit Terrasse! Wir haben eine schöne Woche im Bad Kissingen gehabt. Die Wohnung war in der ruhige Lage und nicht so weit vom Zentrum. Alle Lebensmittelgeschäfte in weniger Minuten sind erreicht. Die Wohnung hat alles, was man braucht: bequemes Bett, kleine Küche und eine nette Terrasse! Wir können gerne diese Wohnung weiter empfehlen! vielen Dank für die nette Bewertung und für die sehr ordentlich hinterlassene Wohnung. Wir wüschen Ihnen alle Gute, Ihre Vermieter. Parking in front of the house for free. 1 Kind im Elternbett frei. Parkplatz vor dem Haus kostenlos. WLAN Internet inkl. Preise zuzüglich Kurtaxe:3,50 Euro / ÜN / Pers. 3,50 Euro pro Pers. und Tag, Kinder unter 18 J. frei. Für die Kurtaxe benötige ich eine Anschrift, Staatsangehörigkeit, Geburtsdaten und Namen aller Personen. Diese Angaben werden bei Buchung fällig, da die "Gastkarte" online" vor Anreise ausgedruckt wird.